Did you know that New York City was, for a short period of time, the first U.S. capital? Or that George Washington took his oath of office as our first President on Wall Street? 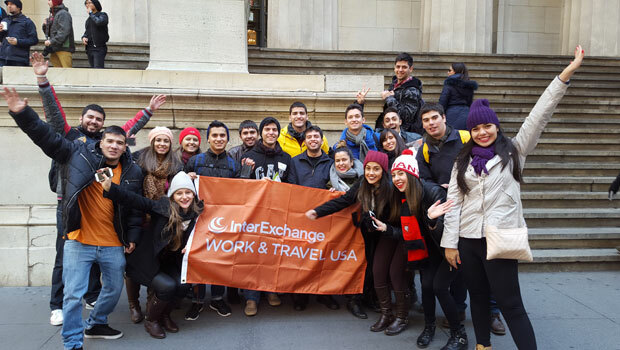 Participants from Paraguay and Brazil learned these interesting facts while on the InterExchange tour of the Federal Hall National Museum in lower Manhattan. On a museum-led tour, students were taken through the building’s grand rotunda and into rooms containing historical artifacts and information from our nation’s founding years. Participants were also shown original vaults that once housed millions of dollars in gold, silver and coins. Federal Hall is an impressive all marble structure that can clearly be seen from the cobblestone section of Wall Street. From the moment you walk up to the large main staircase you immediately come face-to-face with a larger than life size statue of President George Washington himself. The building has been torn down and rebuilt since its original construction as New York’s second City Hall in 1700, but the historical significance of the site during the time surrounding the American Revolution still remains. This site was home to the first Congress, Supreme Court, and Executive Branch offices. The current structure, a Customs House, later served as part of the U.S. Sub-Treasury. George Washington’s inauguration is even depicted on the walls inside the museum. Many thanks to the Federal Hall National Museum and our informative tour guide who helped our students to experience a bit of little-known American history in New York City!